PHILADELPHIA (WPVI) -- The question of who let the dogs out still might not be answered. But where will the dogs be? That answer is looking like Lincoln Financial Field in South Philadelphia this Sunday night. After right tackle Lane Johnson and defensive end Chris Long wore German Shepherd masks following the 'underdog' team's win over the Atlanta Falcons on Saturday, the masks became a hot commodity in Philly. "Me and Chris Long were talking [at lunch,] and everybody's calling us underdogs, so hey, let's go get us a dog mask," Johnson said. "That's what we did." Amazon quick sold out of the masks. But would Eagles fans be able to wear their dog masks to the stadium for the NFC Championship Game? On Monday, the Eagles answered that question. 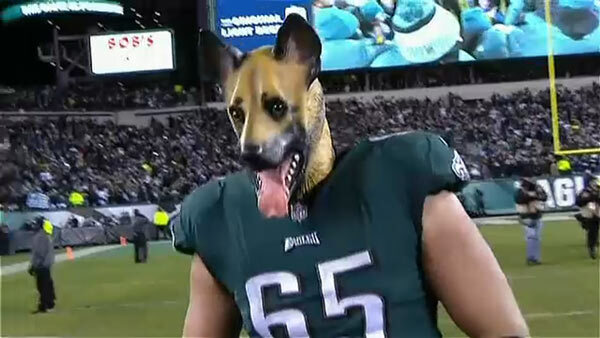 "Doggone it, you better believe dog masks will be allowed at [Lincoln Financial Field] this weekend. Just make sure to take them off when you go through security," the Eagles tweeted. And Johnson is correct. The Eagles open as a 3-point underdog against the Vikings, while the Patriots open favored by 9 1/2 in their game. And fans can wear their masks - just not while going through security.